In what seemed like your typical FL Championship match between Sheffield Wednesday and Preston North End, Preston teammates Jermaine Beckford and Eoin Doyle received their marching orders after a shocking shoving match between the two occurred. 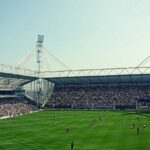 Down 2–0 in the 81st minute, Preston North End elected to sub on striker Eoin Doyle. Immediately making an impact, Doyle scored in the 82nd minute to bring his side within one of Wednesday. Over the remaining eight minutes, frustration set in for Preston and soon Doyle was seen pushing fellow striker Jermaine Beckford, initiating a scuffle between teammates. The two strikers were quickly split apart by other teammates and Sheffield Wednesday defenders. Once separated, the referee showed each player a red, leaving Preston North End to finish the match one man down (Sheffield Wednesday’s Fernando Forestieri was shown a red in the 65th minute). The match concluded with a score of 2–1 in Sheffield’s favor. Reports suggest that Preston’s manager, Simon Grayson, has planned to practice hugs, hand holding, and friendship bonding in the next training session. With Preston North End sitting 14th in the Championship Table, they will need a lot more than sunshine and rainbows to challenge for a promotion spot, though. This is not the first time two teammates have fought on the pitch. In the world of football, intra-team battles are strangely prevalent. For example, in the 2014 World Cup, Cameroon teammates Benoit Assou-Ekotto and Benjamin Moukandjo shoved it out after a defensive lapse. Or what about that time Frederico Higuan and Kei Kamara fought each other to take a penalty kick for the Columbus Crew? Although more civil, Kamara and Higuan’s scuffle led to Kamara’s departure from the club. Dynamo Kiev players came to blows during a training session in 2013. At the end of the day, these boys are teammates and need to love each other. And yes, I called them boys.